Due to technical difficulties I won’t be posting the pic I took at Toys R Us, but yes, Star Trek Kre-O sets have been sighted. I found a few of the sets earlier(but not all of them). These sets come with parts that light up as their main gimmick. Not sure when other retailers will begin to put these out, but Toys R Us is your best bet if you can’t wait any longer. Happy hunting! Are you planning to Kre-ate your own starfleet? Read on to check out the new KRE-O images! 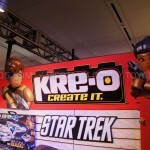 PAWTUCKET, R.I. – February 9, 2013 – In 2013, the KRE-O building set brand from Hasbro boldly goes where no one has gone before. Based on the upcoming STAR TREK INTO DARKNESS movie from Paramount Pictures, directed by J.J. Abrams, the KRE-O STAR TREK line, under license from CBS Consumer Products, features a variety of intergalactic space vehicles from the movie along with collectible KREON figures based on iconic STAR TREK characters. 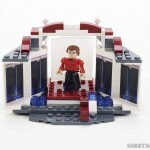 The new KRE-O Star Trek line also marks the unveiling of LIGHTTECH, a light up building feature within every space vehicle that allows kids and fans to truly build the next generation and bring their fantasy to life. STAR TREK INTO DARKNESS opens May 17th, with advance screenings in IMAX on May 15th. Hasbro, in a groundbreaking move for entertainment based building sets, also teamed up with Bad Robot to create a KRE-O STAR TREK stop motion digital short featuring KRE-O STAR TREK sets and STAR TREK KREON figures. *The KRE-O STAR TREK stop motion digital short will be produced by Bad Robot in partnership with Paramount Pictures and features icons of the STAR TREK saga in a stand-alone storyline. Fans can stay tuned for release information regarding the stop motion digital short and can watch a trailer for it on the official KRE-O Youtube channel here: http://bit.ly/TKbhB0. Explore the final frontier with the crew of the U.S.S. ENTERPRISE, the iconic ship from the STAR TREK INTO DARKNESS movie. Inspired by the ship featured in the film, the KRE-O STAR TREK U.S.S. ENTERPRISE is 18-inches long and is the first KRE-O set that actually lights up featuring LIGHTTECH! Explore the bridge interior play area, glowing warp engines, and launch a projectile from a lighted photon torpedo. Kids and fans alike will be excited to join KREON figures of CAPTAIN KIRK, SPOCK and DR. MCCOY on the bridge to defend against two villain KREON figures. Set includes 432 pieces and five KREON figures. Requires three AAA Alkaline batteries. Batteries not included. Take the battle to a far away KLINGON planet with this iconic enemy ship from STAR TREK. Based on a ship featured in the film, the KRE-O KLINGON BIRD-OF-PREY building set features LIGHTTECH bricks that illuminate the cockpit and two firing projectiles on the ship’s wings! Open the hatch and put in one of the four included KREON figures to pilot the ship, including CAPTAIN KIRK, UHURA and two KLINGONS. Set includes 236 pieces. Requires two LR41 Alkaline batteries. Batteries are included. Pretend to carefully lower KREON figures onto dangerous, volcanic planets with the KRE-O STAR TREK SPOCK’S VOLCANO MISSION, from the STAR TREK INTO DARKNESS movie. The KRE-O SPOCK’S VOLCANO MISSION building set features LIGHTTECH that illuminates the cockpit of the ship and can be rotated 90-degrees to provide light for the KREON figure to be lowered out of the ship with the string zip line feature! The building set also includes a push lever activated erupting brick volcano. 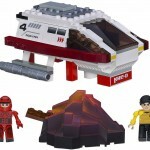 Set includes 141 pieces and two KREON figures (SULU and SPOCK). Requires two LR41 Alkaline batteries. Batteries are included. ‘Beam me up SCOTTY!’ Based on the iconic TRANSPORTER from the STAR TREK INTO DARKENSS movie, the KRE-O STAR TREK TRANSPORTER TROUBLE building set features a mechanical push lever that rotates KREON figures to the other side of the build. LIGHTTECH pieces under the KREON figure illuminate by pushing a lever to enhance the ‘magic’ of the TRANSPORTER! 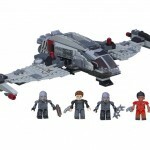 The building set includes 65 pieces and two KREON figures with weapons (SCOTTY and a KLINGON). Requires two LR41 Alkaline batteries. Batteries are included. Based on iconic STAR TREK characters from the upcoming STAR TREK INTO DARKNESS movie from Paramount Pictures, these KREON FIGURE PACKS feature one collectible KREON figure and accessory per pack, with six different characters available in the spring of 2013 including: GORN, CAPTAIN NERO, KEENSER, GRASIA, KINGON and LIEUTENANT SPRONG. Twelve additional KREON figures will be released in fall 2013, including: CAPTAIN KIRK, SPOCK, BORG DRONE and GENERAL CHANG. Each figure sold separately. We’ve mirrored the related items, click the headline of the story to check them out. For the full write-up and all of the images, including GI Joe and Transformers images, check out the Coverage At TFW2005.com. More information after the jump. We’re at New York Comic-Con 2012. 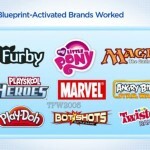 Hasbro is showing off soem items. 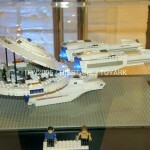 First up is their Star Trek Kre-O. You can also check out the G.I. Joe Kre-O’s at our sister site Hisstank.com. Check out the pics by reading on. Be sure to check out our network sites for more New York Comic-Con 2012 Coverage. 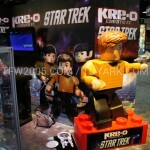 Check out the first pics of Hasbro’s Kre-O display from San Diego Comic-Con 2012. Included is a cool Star Trek sneak peek and a look at some Battleship pieces. All times are GMT -4. The time now is 1:06 AM.